Angry neighbors confronted a group of landowners and an architect proposing a five-story,17-unit building at 24th and Capp streets in a meeting Monday night that lasted nearly two hours and ended with few clear conclusions except that neighbors want more affordable housing on the corner. 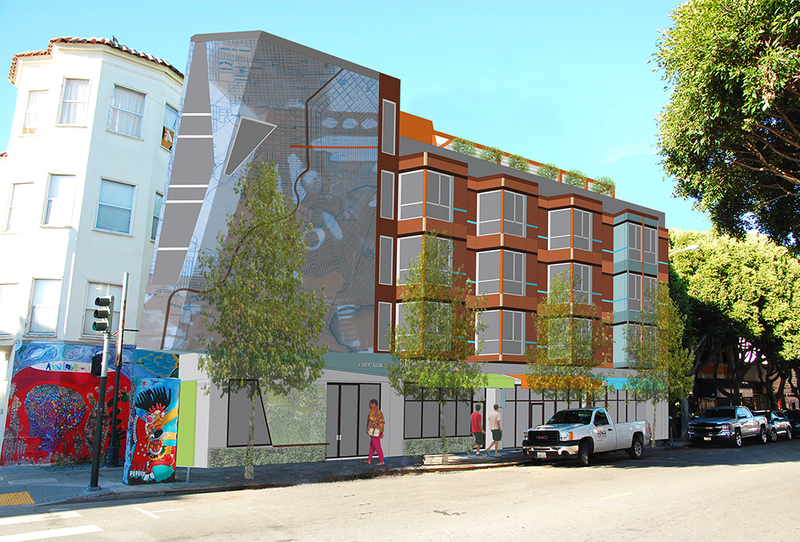 The building proposed for 3230 24th St. must squeeze into a narrow, triangular lot, currently home to eight parking spaces and walls full of murals. 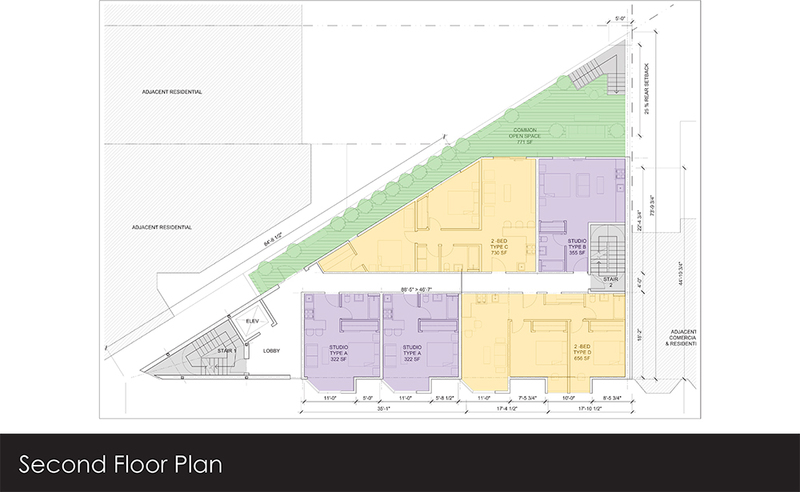 The lot’s shape makes it difficult to fit enough units on the site to make the project pencil out financially, but the property owners, the Galu family, presented the proposal as the best use of the space because of the city’s need for housing. They hope to rent the completed units, two of them at below-market-rate. Several neighbors, however, said they see the project as a gentrifying force in the neighborhood. The mood began to sour early on, during a discussion of a large wall on the 24th St. facade of the project that architect Lev Weisbach said would be reserved for a mural. Someone asked whether they had a muralist in mind already, which the architect did not. “We don’t want to tread on anybody’s feet,” he said. “You’ve already done it,” the resident retorted. Neighbors pressed the property owners on how much they expected to be earning from the units in the building. At first they demurred, but then offered that market rate for a studio was about $2,000 a month. “All I can say is we’re not rent gougers,” Joe Galu said. “What’s most needed in the neighborhood is the families who already live there,” activist Raeleen Valle-Brenes said. The conversation leapt from one topic to the next, often with several conversations occurring at once among the dozen or so people in attendance. At one point a woman, irritated by the architect’s tone, walked out of the meeting. Speakers admonished each other about interruptions, which were plentiful, or in some cases, told the architect they didn’t want to hear from him anymore. The neighbors, again and again, reiterated the desire for below-market-rate housing. The Galus and Weisbach emphasized that they were a small team and locally based – the Galu family has owned property around San Francisco for years and the brothers were born and raised in San Francisco. The project, they said, is relatively small, and not being put forward by a large, out-of-town corporate developer. “You guys walk in here as if you know who we are or what we are,” Weisbach told the group. “I know that you’re trying to gentrify the neighborhood,” a neighbor said. “Why don’t you step up your game to at least a third?” asked Carlos Bocanegra, a housing rights lawyer, referring to finding ways to add below-market-rate units. Bocanegra wanted to know why Weisbach and the Galus hadn’t started their calculations at 30 percent below-market-rate and worked backward to something that would yield them an acceptable profit margin. The developers emphasized that building on the lot would be expensive as it was – and would be more so with requests from the community for union labor and other concessions. Erick Arguello, president of the Calle 24 Latino Cultural District, wanted to know if the property owners would accept Section 8 vouchers, which they said they would consider. Roberto Eligio Alfaro, executive director of the Homies Organizing the Mission to Empower Youth, or HOMEY, said residents have been addressing dozens of proposals around the neighborhood in the hopes of getting more affordability. Later, someone brought up the figure again, pointing out the relative insanity of the local housing market. “I was born and raised in the Mission also, and I own a piece of property that was passed down and we want to make it a reasonable piece of property to pass forward,” Galu said. “To whom?” the neighbors asked. “To my grandkids. To the Mission, to the people that live in the Mission,” he responded. “Is that my fault?” Galu wanted to know. “It’s absolutely not your fault, but I’m trying to be real about this,” Alfaro responded. Galu wanted to know whether the city would provide fair market value, and had doubts about whether having the city put affordable housing on the site instead, given the pushback against the proposed housing, would be feasible. “Why do I have to be a give-back-er?” he asked. “Do you want a vacant lot?” Galu asked. “No, I want affordable housing,” Bardsley responded. But if affordable housing isn’t an option, then what? Arguello from Calle 24 reiterated his alternative suggestion, namely that the developers build a parking structure instead of housing. Weisbach said the city had rejected that idea outright; Arguello said in his conversations with officials, it seemed doable, because the area is part of the Latino Cultural District. In the District, Arguello said, special rules apply. “Everything that comes to this area has to meet the standards of the Latino Cultural District,” he said. Weisbach said the proposal had changed since earlier talks with Calle 24, with the bay windows now angled at 45 degrees to make them softer, and some color and greenery added. In talks with the city, he said, he had discussed that housing buildings are meant to fit their surroundings, not be landmarks. One element, however, did stand out: A tall, slanted front end of the building, meant to evoke both a Mayan temple and a train — since the lot gets its triangular shape from rail lines that once traversed the corridor — was not to the neighborhood’s tastes. The architect’s proposal to leave the space blank and uninterrupted by windows in order to facilitate the creation of a mural didn’t seem to convince the residents, who were more focused on its shape. It was a wall, designed to angle away from the adjacent building’s windows and enclose a stairwell, while also allowing access to the existing murals on the site, which would be preserved. But distaste for the prominent accent was one of the few things that crystallized out of the discord. Little else was agreed upon. Several residents asked Weisbach and the Galu family to return with additional, alternative designs. For now, the project will continue to go through the planning process to win environmental review, gather community input, obtain cost estimates, and submit a site permit application. Now every activist is also an armchair architect? It’s no wonder we have a housing shortage! A parking structure!? Seriously? Why is it these supposedly “progressive” neighborhood organizations continually try to promote/protect car-oriented development in our dense, transit rich neighborhood? I have no idea what this term progressive is supposed to mean anymore in this city, but all the evidence is pretty clear that Calle 24 is not interested in anything changing. They are by definition a conservative organization opposed to change. The question first on their lips is not, ‘how do we make this a better neighborhood’ but, ‘how do we make this a better neighborhood for US’. They drive, so parking is important for them and bike paths are not. They own or have rent controlled apartments, so new housing is not important for them. In fact more housing is worse because it has the potential to dilute their base. Right now they own the local supervisor, and the own the political sphere. More people is only a threat to that. By definition they are NIMBYs (no new housing in our backyard) and conservative (valuing tradition and status quo over any change that might negatively affect them even is there is a greater benefit to the whole.). Why anyone would think different is beyond me. They are simply the Missions version of the Telegraph Hill Dwellers association. Completely ridiculous. We need this housing in the mission and the Galu family should be able to charge what the law allows. These activist are part of the problem!